Students settle into their seats and delve into their popcorn as the zombie thriller The Girl with All the Gifts creates a dystopian future on the screen in Highsmith Student Union. Lila Welsh, head of the movies and films committee for Underdog Productions, hosts movie nights each week to give students something to do on campus, whether they do not have cars and cannot get off campus or just want to destress after classes. “We try to show a huge spectrum so that everyone can find something that they want to watch,” Welsh said. Welsh, a senior environmental studies major at UNC Asheville, joined Underdog Productions her sophomore year and became the head of the committee at the end of last spring, with this school year being her first as acting head. The committee shows movies up until Thanksgiving on Friday nights and occasionally on Thursday nights, Welsh said. Students can enjoy concessions, which committee members serve before and sometimes during the show depending on the turnout, along with the movies for free. When showing Get Out, Welsh said she sat behind the concession stand the entire time because so many people came out and kept coming up for popcorn. “Movies that I wasn’t expecting as high of a turnout still pulled a lot of people,” Welsh said. Throughout the semester, the committee has shown blockbuster hits such as Guardians of the Galaxy Vol. 2 as well as childhood favorites like Hocus Pocus. Welsh said the semester will conclude with Popstar: Never Stop Never Stopping on Nov. 9 and Rogue One on Nov. 17, which will be in collaboration with Star Wars trivia. Underdog Productions holds movie nights every night in the Grotto of Highsmith Student Union. Photo by Aiden Stewart. Welsh said Underdog Productions will show another movie, But I’m a Cheerleader, after Rogue One, but through the awareness committee and not the movies and films committee. Leila Beikmohamadi, president of Underdog Productions, said the weekly movie showings allow students to have a relaxing night for free to get away from work, stress and school, which relates to all the events coordinated by Underdog Productions. “We are also trying to create a sense of community and creating events that students will really get something out of,” Beikmohamadi said. Welsh and the other committee members work hard to bring a diverse array of movies to the campus, Beikmohamadi said. A lot of thought, passion and excitement is put into choosing what movies to show. When determining which movies to show for the semester, Welsh said they talk about what movies the committee members like and what movies they think would do well with the student body. Julia Quigley, the craft works committee director for Underdog Productions, said the movies and films committee has a great idea of what the student body would generally like to see. While she usually does not help with the movie nights, Quigley said she has helped set up chairs in the past since so many people showed up. 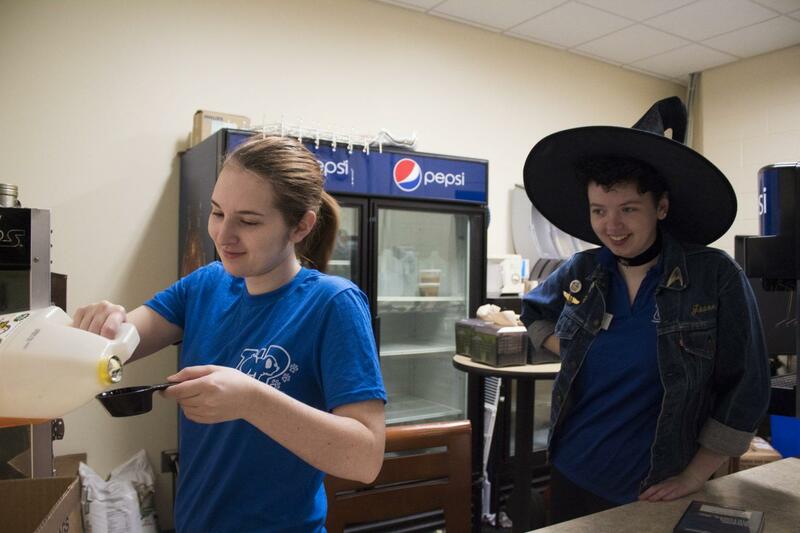 Quigley normally attends to enjoy the movies and support her fellow co-workers, such as at the recent showing of Hocus Pocus to celebrate the Halloween season. Welsh said other than watching the movies herself, her favorite part of the movie nights includes seeing fellow students enjoy the films being shown, especially the ones who regularly attend showings. Next semester, Welsh said she plans to try something different with the movie nights by holding one off-campus and buying out a theater, so students can pay only a couple dollars for a ticket to Black Panther. Welsh said she tries to anticipate and listen to what students would like to see, welcoming recommendations through email or in person.